Sigma Force returns for another action-packed adventure in The Doomsday Key by James Rollins. A secret organization within the Defense Department, Sigma Force is an elite group of former Special Forces soldiers who also have advanced degrees in various scientific disciplines. They are once again trying to take down the Guild, a mysterious group of bad guys who are behind the murder of a senator’s son during an attack on a Red Cross camp in Africa. The camp was taking part in an experimental farm project, so Sigma Force begins investigating why the crop of genetically modified corn being grown here was destroyed. Their investigation takes them across Europe and expands to involve Celtic symbols, the Vatican, and a medieval book known as the “Doomsday Book.” In addition to the usual members of Sigma Force, Rachel Verona, of the Italian Carabinieri, returns from previous books. The mysterious Seichan also returns and Commander Gray Pierce has to decide if she can be trusted. I’m a fan of James Rollins’ Sigma Force books because they have great characters, non-stop action, and are grounded in science and historical facts. In The Doomsday Key, the reader is given lots of information about genetically modified foods, the history of the Celtic cross, and the Irish Saint Malachy, but it’s not at all boring. Rollins manages to weave these different bits of information together into an interesting story and it’s probably my favorite one of his to date. I would compare this book to The Da Vinci Code or Angels & Demons by Dan Brown because it also involves religious symbols, a shadowy organization of bad guys, and racing through Europe to find clues. This is the sixth book to feature the Sigma Force, but I think you could start with this one and catch on quickly. If you like it, go back and read the first book in the series, Map of Bones. 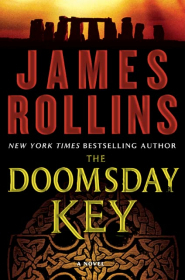 Buy The Doomsday Key by James Rollins on Amazon by clicking here  .